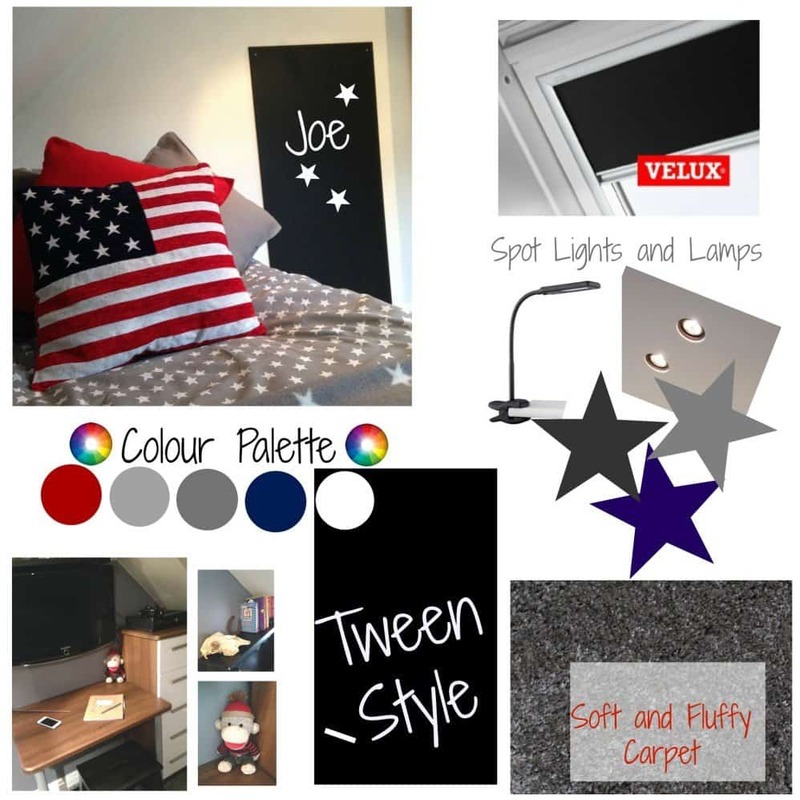 I have talked lots in the last couple of weeks about how decorating is just not my thing, but what I do love is design so I thought I would share the inspiration behind Joe’s new tween bedroom. Our home is very quirky and all of the up-stairs rooms are built-in the eaves of the roof. This means we have reasonable floor space but as the roof slopes, not very much wall and head space. Because of this rooms have to be planned and designed to maximise space. Joe’s main brief was that he wanted a desk, also I wanted to also ensure he had somewhere to store his toys. To solve this we bought a divan bed with drawer space underneath and a tall thin chest of drawers to avoid taking up too much floor space, these ensure his toys are stored out of sight giving him a clutter free environment yet with easy access to toys and games. Joe chose the colour scheme himself, and surprised me with quite a contemporary simple colour scheme. He chose an American flag cushion to plan the whole theme around, and went for cool greys for his bedding to continue the American theme. Joe’s is constantly moaning about the sunlight in his room in the mornings, so wanted a blackout blind. As the window is in the eaves we chose a black VELUX blind, this looks stylist but also totally blogs out the morning sun, ensuring he sleeps in that little bit longer at the weekend, hoorah. We added a chalkboard to the wall and chose a small lamp to clip to a shelf to avoid taking up to much desk space and mounted a flat screen T.V over the top, that can be linked to his Xbox. Overall, his room looks clean, crisp and modern, Joe is thrilled with it and it is perfect for a tween. It’s a difficult age isn’t it? Not into kiddy styles any longer, yet not quite a teen. However I do think a little of Joe’s inspiration came from Jack and his style, I suppose that comes with the territory of having an older brother. Great post- love the theme! Soemthing about being a tween and needing to change your room to be a bit more grown up – love it !